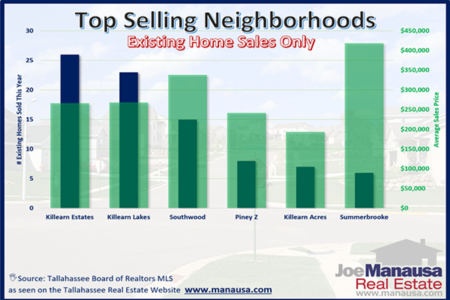 Killearn Lakes Plantation was the top selling neighborhood (again) in the Tallahassee real estate market in 2015. Scores of walking trails, parks, and lakes creates a friendly and close-knot community. Wildlife is still very much active in the area, as it is not uncommon to see fox, bald eagles, deer and turkey roaming throughout the conservation easements. KLP is the largest, most active neighborhood in the 32312 zip code and continuously ranks among the top 3 places to live in Tallahassee. It is important to note that the narrative contained below is for sales through December for all years, but the graphs and the closed sales table will be continuously updated into the future (meaning bookmark this page if you always want to know the current status of homes in Killearn Lakes Plantation). Killearn Lakes Plantation home prices continue to trickle downwards and have reached the lowest level recorded since 2004. The average home price now is $243,900, meaning homes are 17% cheaper on average than they were in 2006. Home sales activity remains strong in Killearn Lakes. In 2015, there were 269 closed home sales in Killearn Lakes Plantation and its included subdivisions, which was the most homes sold in a year since 2006. Average home values in Killearn Lakes recovered nearly 5% in 2015. Currently, home values are 21% below values recorded at the peak in 2006. The average value of a home sold in Killearn Lakes Plantation was $114 per square foot in 2015. The average home size sold in Killearn Lakes Plantation typically falls in a range of 1,800 to 2,100 square feet, and it was the larger homes being purchased in 2015. The 269 homes sold in 2015 averaged 2,027 square feet. 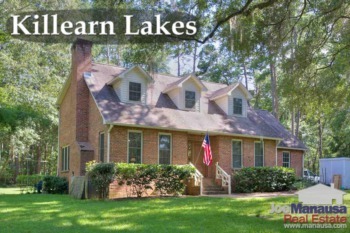 The following list includes more than 6,500 home sales in Killearn Lakes Plantation going back to 1991. You can change the sort order by clicking any one of the titles in the header. I hope you enjoyed our January 2016 update on home sales in Killearn Lakes Plantation, please feel free to drop me a note if you have questions not covered in this report.